Design a Business You Love! The Better Business Plan Makeover will transform you from stressed and overwhelmed to in-charge and living the life of your dreams. This life-changing program will guide you through the steps in creating a business plan that will not only set you up for financial success, but will also build a business that gives you the freedom to live a life of abundance. Stop choosing between growing your business and living a life you love, now you can have both! Get out your computer and log in to your Better Business Plan Blueprint Course. Watch the short and informational video and fill out the corresponding section on your template. Do a little happy dance on your living room floor because you have now completed your very own Better Business Plan! Start implementing the information found in your business plan and begin your quest to living the life of your dreams! Schedule your interviews with Oprah, the Today Show, and Forbes because you are that stinkin’ amazing! Why A Better Business Plan? 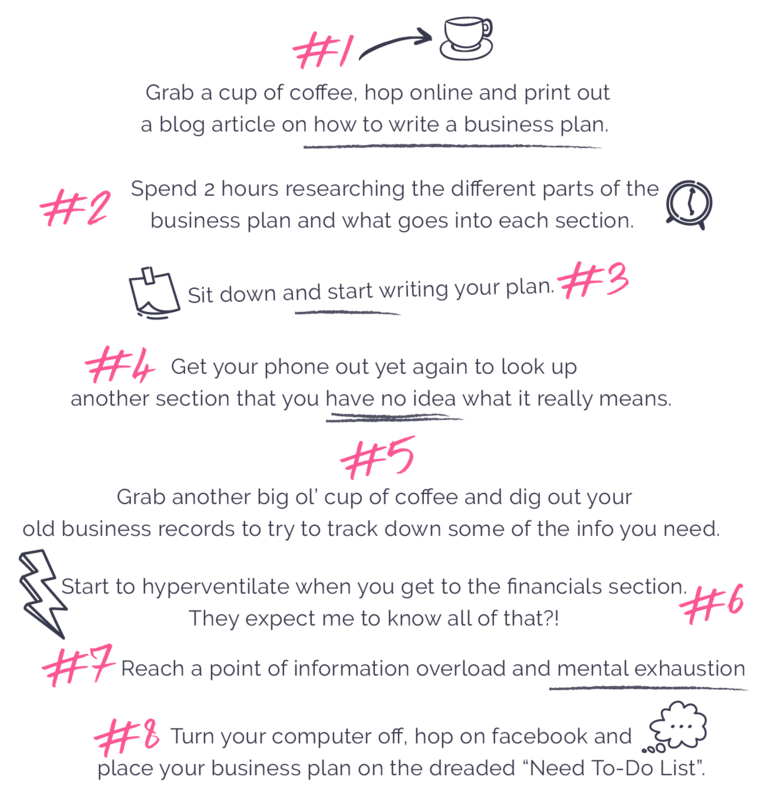 If you’ve been in business long, or are even just getting started, you know that “experts” recommend filling out a Business Plan for your business. Do you know why this is? New businesses that fill out a business plan before launching have a 30% greater chance of actually getting off the ground! Add to that the fact that a well-thought out business plan has been shown to be a common factor in existing businesses that are on-course, growing, and thriving and you will see that a business plan is a valuable tool for any business! A truly successful business plan is one that designs a plan for a successful and profitable business around the needs, wants, and expectations of its chief operating officer-that's you!! I’ve seen way too many successful businesses ultimately shut their doors because the business eventually overwhelmed its owner and left the company drained from the top down. I don’t want this to be you! Take the time now whether you are just starting out, have recently launched, or are in the growing stages of your business, to craft a business plan that not only sets your business up for limitless growth, but also delivers the dream life that you deserve. You need a Better Business Plan! life + business of your dreams! What is a "Better Business Plan"
and Why is it Essential to my Success? Get clear on your path to success and how you’re going to get there. Clarify what your Lifestyle goals are and how they will guide your business framework. Come up with your business structure and framework. Come up with an irresistible description of what your business REALLY does. Discover Your Ideal Client and why you’re the obvious choice for them! Learn why competition is a GOOD thing and how it will make you better! Craft an offer people won’t be able to resist! Plan a realistic budget for the next 3 months, 6 months, and 1 year. Uncover some Money-Mindset secrets that will open you up for amazing growth! Craft a marketing strategy that is sure to result in dollars in the bank! Learn ways to maximize your outreach while minimizing your expenses. Get clear on who you’re really selling to. Write an amazing Executive Summary which will serve as a spring board to launch you to amazing results! Finish strong with a plan for growth that will motivate you to get going on your dreams! A Professionally Designed Better Business Plan Template-an editable template that allows you to follow along with the program and complete your very own, personalized Better Business Plan without the stress and overwhelm from going it alone. 6 Video Lessons that walk you through not only the “How” to come up with your Better Business Plan, but also, “Why” these steps are so essential to your success. Some crazy-cool bonuses including- “Get Funded Fast”-An easy-to-follow guide to raising business capital to fund your Better Business venture! Also included is a copy of my trusted “Top Ten Start-Up List”- An invaluable list of tried-and true resources to check out and bookmark to save you hours of time and aggravation researching on your own! ...and I have a bold statement to make: What if I told you that a successful business could actually be a bad thing? Yes, that’s right! A thriving, wildly successful and fulfilling business can actually be something that strangles the life and joy right out of you! How can that be you may ask? No matter if your business is ridiculously successful or a flop, if it robs you of your time, sanity, and freedom, it is in fact, a failure! I am here to tell you that your business needs to be built in a way that actually gives you the financial and time freedom that you need to allow you to spend time with your loved ones, experience new adventures, explore new opportunities, and pour blessings into new passions and people. Too many business owners start out with a goal to start a business that brings financial freedom to their lives only to find that they don’t have the time to enjoy their hard work once their business is up and running. That’s why I am here to offer you a different way. Envision a business that actually frees you up to spend time with the people you want, doing the activities you love, and provides you with the finances to fund all of it. It is essential to plan your lifestyle goals into your business goals and that is what you will discover with the Better Business Plan Blueprint.